"In the DRC, there are major challenges in terms of resources and lack of infrastructure, but we see that there is a political will to move forward, and to organize the local elections as soon as possible," the Director of MONUC's electoral division Carlos Valenzuela said today. "There is a general consensus that the local elections are very important, not only to complete the electoral cycle but to go forward, to legitimize local authority and the decentralization process," he added. However, Mr. Valenzuela said that local elections would be more complex to organize than the presidential election which took place with UN support in 2006. He said that the electoral register would need to be updated. 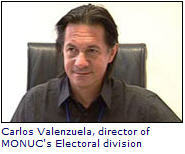 "The local elections are more complicated to organize for technical and operational reasons. The number of electoral constituencies is much larger, and that complicates all the logistics preparations. The numbers of candidates are also multiplied by 10, and the operations of registering of candidates are much more difficult," he stressed. Organizing elections in the country was also expensive, he said. "One of the problems is that it's always expensive to hold elections in the DRC, because of the vastness of the territory, the topography and the lack of infrastructure. The elections of 2006 cost more than $500 million. We estimate that the local election budget will be much less, but still substantial, at around $160 million." Mr. Valenzuela added that the mission was hoping that the Congolese parliament would work on administrative decentralization next month to pave the way for the local elections.